The Program, is a Versatile and portable, designed to clean, tweak and optimize Windows! The program XTR Toolbox is very simple to use portable application which has been designed to optimize, clean, tweak and protect your privacy in Windows and it is Open Source. 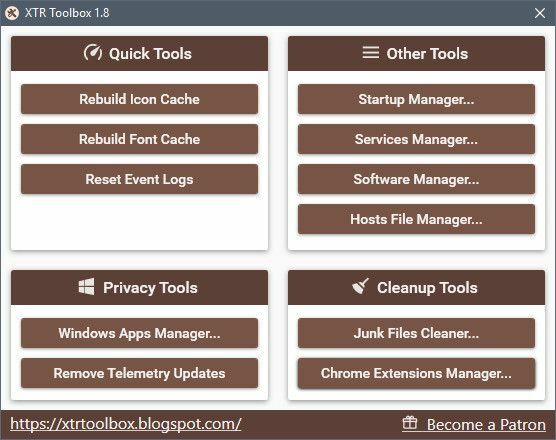 XTR Toolbox is proposed with tools that you will have right at fingertips to tackle a wide range of various tasks like as uninstall Windows default apps, remove Telemetry updates, clean out junk files and manage Chrome extensions. XTR Toolbox also includes a Services Manager, Startup Manager and a Hosts File Manger which lets you view and edit the Windows Hosts file. This program has the Requirements of the platforms of Windows 7, 8.1, 10 (32, 64 bits) / .Net Framework: 4.6.2+.